Dr. Bob is honored and delighted to be joining David Hoffmeister as a guest teacher at his Mystery School in Utah from September 9-13, 2018. You must sign up for the entire month, so this is quite a commitment, but one that is certain to be life-changing. I would love to join you there in a holy encounter. Dr. Bob will be the keynote speaker at the 2018 Greenlight Sanctuaries Retreat and Workshop, held at Unity Spiritual Center in Asbury, NJ. on Saturday August 18, 2018. He will be joined by ACIM authors Corinne Zupko and Dr. Dana Marrocco. The topic is: PIECES OF MIND OR PEACE OF MIND. To sign up, contact Unity at office@unityspiritualcenter.org. I will be presenting with my co-president partner Tam Morgan at the CMC conference in San Francisco. Included in the cost are four all-you-can-eat meals, music, and of course your choice of many presentations by well-known ACIM teachers like Alan Cohen, David Hoffmeister, Jimmy Twyman, and Jon Mundy. I’d love to see you there. ACIM tells us that love makes no exceptions, while fear always does. The ego craves specialness, its substitute for love, and seeks it everywhere. We regard some people as “exceptional” and put them on pedestals, while others go unnoticed. When we choose love over fear, however, and look with Christ’s vision, everyone becomes “exceptional”: a holy Son of God. When you sign up, please let them know that you learned of the conference from me. Thanks! 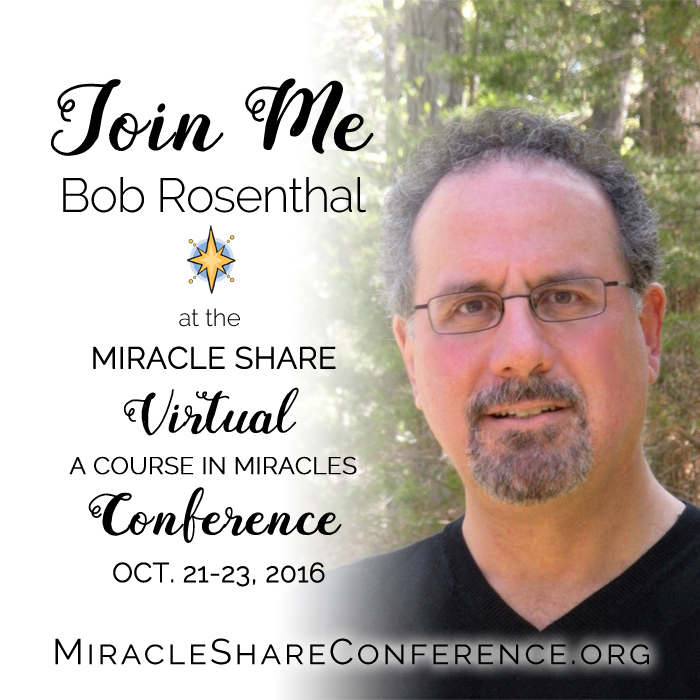 Please join me and other teachers of A Course in Miracles in this terrific conference. Each presenter has 30 minutes to speak on Healing Relationships, followed by another 30 minutes Q&A. So a great chance to interact with us and ask those thorny questions you can’t get answers to in your study group. http://www.miracleshareconference.org/ for more information and to sign up. Come spend the day with miracles, music and merry-making among your fellow students. There will be a few talks, panels, small group discussions, and familiar songs with lyrics adapted to the Course’s message. This is a unique event and if you live in the greater NY City or north Jersey area, you won’t want to miss it.